The Raymond Weil Don Giovanni Cosi Grande 4878-STC-00268 is a handsome black, alligator leather men's watch. It features a black, rectangle dial with luminous hands, a date indicator at the 12 o'clock hour marker and three sub-dials; 60 seconds, 30 minutes and 12 hours. The Raymond Weil 4878STC00268 Watch is water resistant up to 30 meters and has a scratch-resistant sapphire crystal. The Raymond Weil 2935-S5S-01659 is an automatic two-toned, steel and rose gold plated Swiss women's watch. The Jasmine watch boasts a round stainless steel dial with Roman numeral hour markers and a beautiful diamond bezel. Other features of the Raymond Weil 2935S5S01659 Watch include water resistance of up to 50 meters and a date indicator. 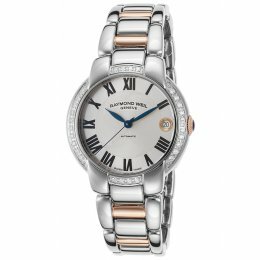 The Raymond Weil 2750-SLS-66081 Ladies Watch is a swiss-made, quality, luxury watch. 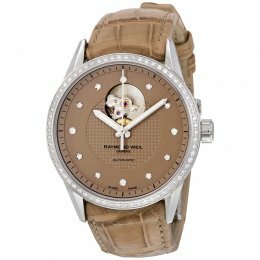 With brown alligator-skin leather and a diamond studded bezel, this automatic watch is the height of elegance. The Raymond Weil Freelancer 2750 SLS 66081 Watch also features water resistance up to 100 meters, and a 38-hour power reserve. The Raymond Weil 2750-SLS-62081 is a luxurious ladies watch that is both beautiful and high functioning. 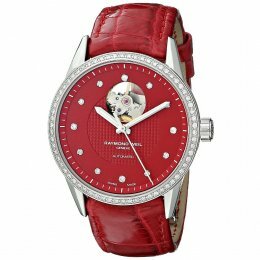 It is an automatic watch from the Freelancer collection featuring a red alligator leather strap, a red dial and a diamond bezel. Enjoy the highest standards of quality and Swiss luxury with this Raymond Weil Women's 2750SLS62081 watch. The Raymond Weil 2846-STC-00659 Watch is both luxurious and high functioning. It is an automatic watch featuring a brown leather strap, a silver dial with blued-steel hands and a fixed stainless steel bezel. 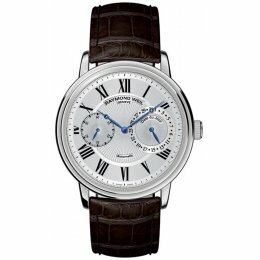 Enjoy the high standards of Swiss made watches with this Raymond Weil Men's 2846STC00659 Maestro watch.